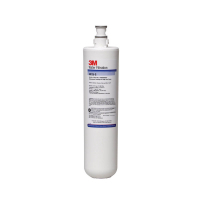 The 3M High Flow Series Replacement Cartridge, Model HF25-S provides consistent quality water by reducing particulate, chlorine taste and odor, and scale. The Sanitary Quick Change (SQC) design allows for easy cartridge change-outs. This is a replacement cartridge for 3M High Flow Series systems. Our 3M High Flow Series Replacement Cartridge, Model HF25-S provides consistent quality water by reducing particulate, chlorine taste and odor, and scale. Excess particulate can clog the spray head in brew baskets, while excess chlorine can cause bitter-tasting beverages. Built-in scale inhibition can help to prevent the potentially harmful effects of scale build-up on equipment. Our Sanitary Quick Change (SQC) encapsulated cartridge design allows for fast and easy cartridge change-outs without the need for a filter wrench. This product is a replacement cartridge for 3M High Flow Series systems. Dimensions: 15- 1/4" x 10- 1/2" Dia.